Whether a sprinter, cross-country specialist or long-distance runner, he'll really enjoy the male blonde runner personalized Christmas ornament with a sateen display cord and our exclusive velvet drawstring pouch. These athletic-looking sports ornaments personalized in hand-painted letters are offered in other male and female looks, so building team unity by getting one for each member may be possible. 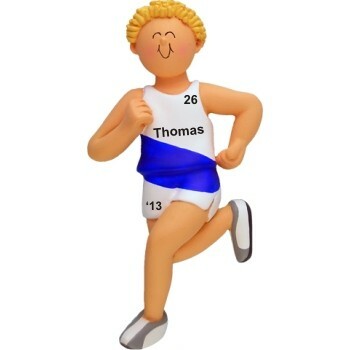 Give your runner a boost of energy with the cross country / jogging male blonde personalized Christmas ornament from Russell Rhodes. Enter up to 2 characters. Christmas Gift for Grandson Dec 18, 2013 Sally S.